As employees age, both employers and employees tend to think strategically about retirement, but their perspectives are rarely the same. Employers are generally focused on maximizing productivity and facilitating smooth transitions, while employees are generally focused on timing – not only about when will they have enough money for a comfortable retirement, but also what will they forfeit when they do retire. These different perspectives often create a tension that goes unresolved, resulting in employees often wanting to continue working past their primes, and employers often forcing them into the harsh reality of “retirement.” An employer’s long-term incentive (LTI) program is often an untapped resource that can be used to manage succession planning and retirement in a more mutually beneficial manner. Historically, a defined benefit pension program served as a critical component of an employee’s retirement strategy. These plans created a highly predictable attrition rate that made succession planning somewhat easier to manage. With the decline (and some say, death) of defined benefit plans which were designed to encourage retirement at a mutually beneficial time, and the rise of defined contribution plans (e.g., 401(k) plans) which are not nearly as rich as defined benefit plans, employees generally have less employer-sponsored retirement protection now than they had a generation ago. Inclination to “reward” or “punish” retiring employees in an inconsistent and non-uniform manner, with one-off negotiations on unvested equity. 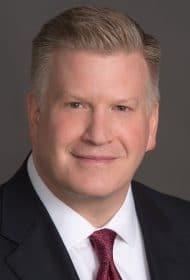 These factors all contribute to the underlying tension between employers and employees as it relates to orderly succession planning and retirement, and tend to trigger sub-optimal retirement behaviors on the part of both employers and employees. What the cost would be for providing more favorable equity treatment to retiring versus non-retiring employees, resulting in less forfeitures. 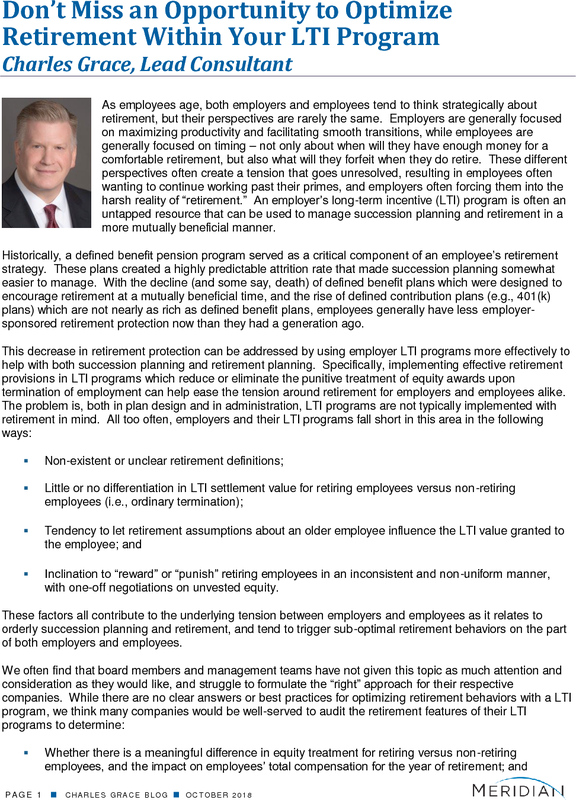 Once armed with these details, boards members and management teams will be better positioned to engage in a productive dialogue to consider whether their LTI programs encourage desired retirement behaviors, and if necessary, formulate a strategy to best address retirement within their LTI programs. Imposing post-termination restrictions (e.g., execution of a release of all claims, and/or non-competition, non-solicitation and non-disclosure obligations) in consideration of the favorable vesting/settlement treatment. The right approach for each employer is not a “one size fits all” proposition. Rather, it typically involves careful and deliberate consideration of several factors, including workforce demographics (i.e., age of LTI recipients), how important succession planning is to the company, how much the company is willing to absorb from a cost perspective, how much time the company needs to plan for a smooth transition and what company interests require the most protection on a post-termination basis. While settling on the right approach can take considerable time and effort, the potential benefits often make it a valuable investment for employers and employees alike.